Artigo de opinião de Yousef Munayyer, sobre o isolamento dos palestinianos desde a criação do estado de Israel até hoje. Lydda, a city home to some 20,000 Palestinians in 1948 quickly swelled to a population of 50,000 as refugees flocked from the cleansed city of Jaffa. After four days of siege, Israeli forces carried out expulsion orders during Operation Dani, leaving fewer than 1,000 residents remaining. Yitzhak Rabin, an Israeli Brigadier General at the time, described how they perpetrated the ethnic cleansing of Lydda and neighbouring Ramle in July of 1948. To this day, however, the Israeli state prevents this description from being printed in Rabin's memoirs. I often wonder what must have been going through my grandfather's head when he, and others among the few who managed to remain, realised the busy municipality that they had once called home had been reduced to a ghost town. Perhaps they were in shock, an understandable reaction, given the circumstances. Perhaps they were busy attempting to care for the injured, of which there were plenty. Or maybe they were trying to secure their possessions from Israeli looters who ravaged the vacant homes and stores of businessmen-turned-refugees overnight. Israeli historians, such as Tom Segev, note that 1,800 trucks of possessions were looted from Lydda alone. Once the dust cleared and the shock subsided, reality must have begun to set in. In a few months' time, the Palestinian Arabs had gone from being a majority living in their ancestral homeland, albeit amid tension, to being a minority living under a state that had just made refugees out of most of their kin and would refuse them re-entry. For Palestinian citizens of Israel, like Palestinians elsewhere, the Nakba was just beginning. The looting which took place was also a preliminary glimpse into the theft of land, property and identity that would ensue in the coming years. Ironically, David Ben-Gurion, Israel's first prime minister, who Rabin said ordered the expulsion of Palestinians during Operation Dani, expressed shock that Israelis were simply stealing the possessions of Palestinians in Lydda and elsewhere. How he reconciled a moral defence of ethnic cleansing with moral outrage at looting is beyond my comprehension. Nonetheless, with the establishment of the state of Israel on the ruins of Palestine, theft had to be disguised by legalisms. Prior to the war, Jewish ownership of land in Palestine was minimal. Now, after the depopulation, the vast majority of land controlled by the Jewish state was not owned by Jews and many of the owners now resided in refugee camps. To solve this predicament, the Israeli legislature enacted various laws which allowed the state to assume control of 92 per cent of the land. The first step was using a century old Ottoman law (two-empires old at this point) to declare the land "absentee land". This meant that the owners of the land were not present (because they were refugees not permitted to return) and that the state could assume control of it. But refugees weren't the only ones dispossessed by this measure. Palestinians who managed to remain inside the boundaries of the new Israeli state but were prevented from living on their land became internally displaced persons (IDPs). These IDPs falling victim to Israel's legalised land theft are known as "present absentees". With their society decimated, their family members and kin spread across the region in refugee camps from Lebanon to Jordan to Gaza, their properties looted and land confiscated, Palestinian citizens of Israel had to deal with another reality in the wake of the Nakba: living under martial law. Israeli martial law, which governed Palestinian Arabs from the establishment of the state to 1966, was based on British Mandate-era emergency regulations. In the 1930s, the British used these regulations as the framework for the repression of the Palestinian Arab uprisings. Then in the 1940s, the British used them to crack down against Zionist dissidents. For this reason, such regulations were decried by Zionists prior to the establishment of the state. Yaacov Shapira, an Israeli attorney in 1946, did not mince words when criticising these laws used by the British against the Zionists at the time and likened them to Nazi Germany. Two years later, Shapira would be serving as the attorney general for the first Israeli government and would adopt these very laws to rule over the Arab minority. Martial law was similar in many ways to the occupation we know today. During this period, the military government was empowered to deport people from their towns or villages, summon any person to a police station at any time or put under house arrest, use administrative detention or incarceration without charge, confiscate property, impose total or partial curfew, forbid or restrict movement and so on. This, keep in mind, was not happening in Hebron or Nablus or Ramallah, this was taking place in what many today romanticise as the golden age of "democratic" Israel - inside the green line. After the depopulation, an Israeli member of the MAPAI secretariat remarked in 1949: "The landscape is also more beautiful. I enjoy it, especially when travelling between Haifa and Tel Aviv, and there is not a single Arab to be seen." It is this kind of drive for ethnic homogeneity, present since the founding of the Israeli state, that underpins many of the laws that discriminate against Israel's Palestinian Arab citizens. A Jew from anywhere in the world, for example, can move to Israel - while a Palestinian Arab refugee, born within the present-day borders of Israel is not permitted to return. Likewise, laws also prevent Palestinian Arab citizens of Israel who have non-citizen Palestinian spouses from residing in Israel as a family. This is to prevent what the Israeli prime minister termed "demographic spillover". This restricts the population of Palestinian citizens of Israel from marrying from most of their kin because doing so would mean either having to live separately or living outside of Israel. Budgetary spending is also discriminatory. Despite making up over 20 per cent of the population, Palestinian citizens of Israel have watched the state build hundreds of new towns for Israeli Jews, while a handful were built for the Palestinians. Even these towns, such as Rahat, were built in part to concentrate Palestinian Bedouin from unrecognised villages. Many Palestinian Bedouin villages remain unrecognised by the Israeli state, are not provided with civil resources and are left off the electric grid. Al-Arakib, a village in the Negev, has, as of this writing, been demolished by Israeli officials, and rebuilt by its residents, some 38 times. Indeed, the Nakba is the central and uniting experience of Palestinians everywhere. 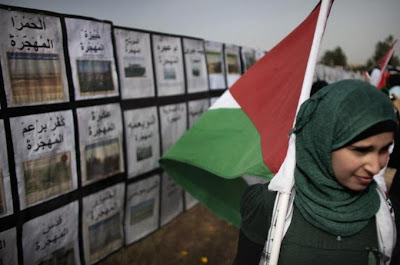 It comes as no surprise then that Palestinian citizens of Israel alive today, who did not experience the Nakba first hand,still have political views shaped by the events of 1948. Polls of Palestinian citizens of Israel, performed as recently as 2010, uncovered interesting trends in the views of respondents based on whether they have relatives who were refugees. Those who have refugee relatives were almost three times as likely to identify as Palestinian first (instead of Arab, Muslim or Israeli) than those who did not. They are twice as likely to support Iran's right to a nuclear program, twice as likely to reject Israel's defining itself as a "Jewish State" and twice as likely to oppose a loyalty oath to the state of Israel. For Palestinians in Israel, it is clear that the Nakba still lingers as a major factor, determining their views toward the state that governs them. In sum, the Nakba and its implications has, since the transformative events of 1948, continued to directly impact the Palestinian citizens of the Israeli state. While Palestinians exist across various borders as refugees, residents or citizens of different states, the Nakba continues to be the tie that binds them. This is not only because of a shared memory from the lives of their grandparents, but also because varying, often harsh, present realities rooted in events of the Nakba can only be relegated to distant memory if a peace, based on justice for the Nakba, can be achieved.